Posted on April 8, 2014 by revivewa	in Travel and Spirituality and tagged 1, feature, UAICC. 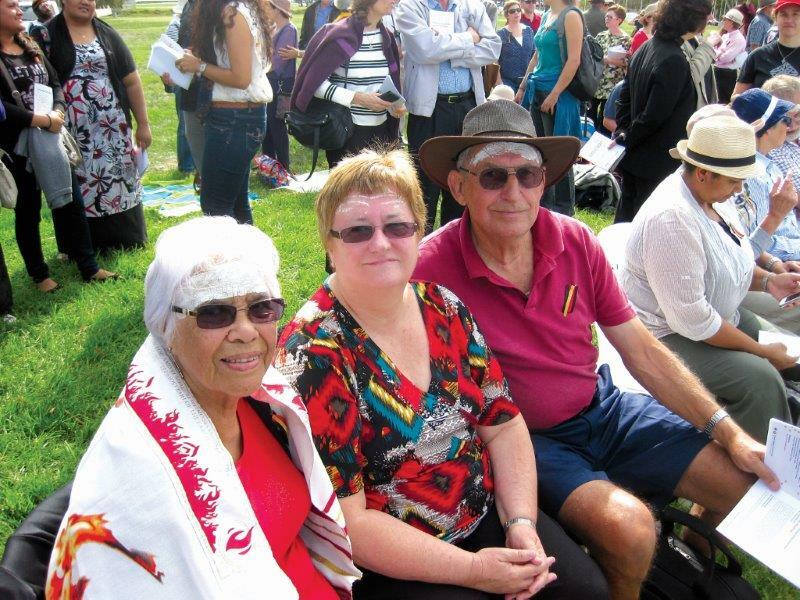 The invitation to travel to Canberra to attend a vigil on the lawns of Parliament House on 18 March 2014 was extended to Uniting Church people throughout Australia. I was on long service leave pending retirement at the time, so I was free to travel to this national event. My husband Robin and I travelled to Canberra as representatives of the WA Synod. The vigil was part of ‘A Destiny Together: A Week of Prayer and Fasting for Justice for First Peoples. It was planned by the Uniting Church Assembly in response to the stories of suffering from Indigenous people affected by the government Intervention in the Northern Territory and the subsequent Stronger Futures legislation. The opportunity to gather with First and Second Peoples from many church communities across this land was appealing, but when I remembered the vigil was part of a week of prayer and fasting I became apprehensive about what that would require of me. The Assembly provided resources including a practical guide to fasting. I was reminded that fasting was a personal discipline to assist the participant to pray. Daily prayer reflections focused on the call for justice for First Peoples. With the resources packed in my bag we set off. Auntie Mona Olssen, Rev Dr Alison Longworth and Robin Longworth before the vigil at Parliament House in Canberra. Our accommodation was at University House. On the morning of the vigil we met people who had travelled from various parts of the country to attend the event. As we travelled together to the venue the anticipation grew as people greeted one another. While we waited for the vigil to begin Robin and I yarned with Auntie Mona Olsson, originally from Mimili in the Anangu Pitjantjatjara Yankunytjatjara (APY) Lands in the north-west corner of South Australia. Auntie Mona is one of the Stolen Generations, having spent time at the Colebrook Home in Quorn, managed by the United Aborigines’ Mission (UAM). Auntie Mona lives in Adelaide and is a respected Elder with the South Australian Uniting Aboriginal and Islander Christian Congress (UAICC). The vigil began with Auntie Agnes Shea assuring us we were welcome to leave our footprints on Ngunnawal country. Rev Professor Andrew Dutney, president of the Uniting Church in Australia acknowledged the welcome and paid his respect to the elders, past and present while Rev Rronang Garrawarra, national chairperson of the UAICC gave the greeting. In a very moving part of the vigil participants were invited to mark one another with ash, the First Peoples were invited to move to the centre of the community and the Second Peoples to gather around them for the prayer of confession. We acknowledged the dispossession of land, language and culture experienced by the First Peoples and the way the Christian church was complicit and actively involved in this. The prayer was followed by the declaration of forgiveness, a prayer for reconciliation and the sharing of the peace. And so the service continued with the proclamation of the Word and the breaking of bread. To share together in this sacramental moment with First and Second Peoples who had travelled from so many parts of the country was a rare and privileged experience. At the conclusion of the vigil we travelled to Wesley Uniting Church where a light lunch was served. Through the afternoon there was much sharing of stories and music. Before long it was time for people to leave their footprints in Canberra and begin the journey home. Top image: Rev Rronang Garrawurra, chairperson National Uniting Aboriginal and Islander Christian Congress, and Rev Prof Andrew Dutney, president of the Uniting Church in Australia.